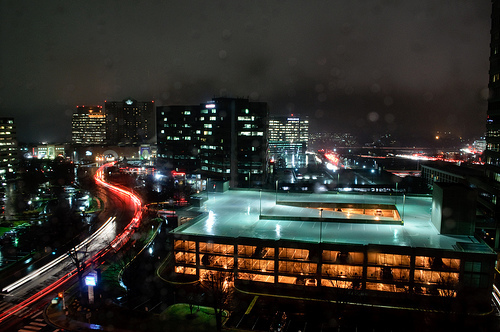 Rush hour in Tysons Corner in Northern Virginia. Photo by mindgutter. Throughout the current recession, a pattern has been emerging that has fascinated – and sometimes excited – urban planners and policymakers. Home values in cities and close-in suburbs have been falling less than those in far-flung suburban areas. (See articles in the New York Times, Boston Globe, Washington Post and NPR.) This news has caused planners to speculate that transportation costs are finally starting to show up in household financial calculations. As citizens begin to pay closer attention to their wallets in these tough times, spending $10/day on gas for a 40-mile commute is less feasible. Our tight economic situation (and the fluctuating price of gas) is finally making the incentives point in the right direction – toward more compact, urban growth and against sprawl. Buying a home in an outlying area far from one’s job no longer makes as much sense as it once did. While it’s good that housing in more compact, convenient and transit-rich locations is becoming more desirable, there is another side of this coin. Not everyone is moving into the center city. Because home values in close-in areas have remained high, working families are being forced to the far reaches of metro areas, exacerbating congestion and pollution. According to a new report from the Urban Land Institute’s Terwilliger Center for Workforce Housing, that is precisely what is happening in the Washington area. The study argues that while the metro area as a whole has experienced an increase in affordability over the past few years, workforce households are priced out of rental and for-sale housing proximate to major employment centers. Workforce households are defined as those with incomes 60 to 100 percent of area median income (AMI) – $43,140-$71,900 for a single person and $49,320-$82,200 for a couple. This group makes up a quarter of all households in the metro area. The six core employment areas named in the report are Alexandria, Bethesda, Downtown DC, Reston/Herndon, Rockville and Tysons Corner. High land prices in those areas make the development of affordable multifamily housing difficult. The report estimates that there is a shortage of about 40,000 for-sale homes within a 30-45 minute commute of these employment hubs that are within the reach of workforce households. As incomes and housing values in core areas continue to rise and housing development remains depressed, this shortage is expected to grow by 5000 units per year from 2010 to 2030. Meanwhile, working families are forced to locate at the periphery of the metro area, driving farther and farther to work. This report highlights our failure to look at the big picture when planning transit-oriented and residential development in the center city. Building a truly sustainable city requires the creation of housing opportunities for all income levels in areas served by public transportation. Though a good deal of new housing has sprung up around Metro stations in recent years, little of it has been affordable. Its high desirability and convenience makes it expensive, and much it is geared towards singles, not households with children. The founder of the Terwilliger Center and chairman of apartment developer Trammell Crow Residential calls for government’s help in order to make affordable housing development more feasible, and perhaps DC is making moves in the right direction with the enactment of inclusionary zoning this summer. The new rules require that new buildings with 10 or more units, or existing buildings of 10 or more units that are increased in size by 50%, provide 8-10% of new units as affordable to people making up to 80% of AMI, depending on construction type and zoning district. In any case, if the DC metropolitan region is serious about addressing climate change and pursuing the targets outlined in its soon-to-be-adopted 2050 regional plan, the affordable housing issue must be addressed in conjunction with transportation and environmental goals. The plan calls for a reduction in vehicle traffic and dense, mixed-use projects near transit in regional activity centers. Some of the activity centers identified, such as Downtown DC, Alexandria, Rockville and Tysons Corner, were also cited in the ULI report as lacking affordable housing. Half of new residential construction, and 80 percent of new affordable units, will be located in activity centers. Tags: affordable housing, congestion, development, Tysons Corner, Washington, D.C.